Luxembourg Garden, originally uploaded by pamhule. 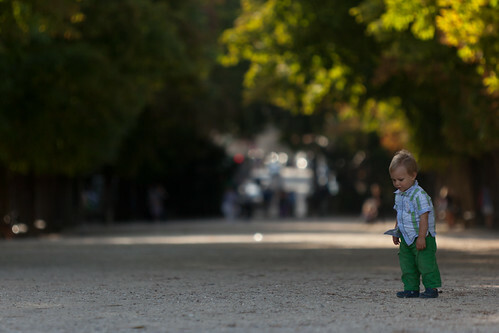 A Thursday afternoon in the Luxembourg Garden, Paris. The boy is pausing as his father calls his name, just outside the frame. I was carrying my 70-200mm 2.8. I took this shot at 200mm with the lens wide open. As always, it produced very nice bokeh. I was also happy with the green color scheme and how the boy's green pants matched the background.